Chick-fil-A restaurants are making the news for having greater sales than one of their biggest competitors, KFC. The fast food chain is innovating with their menus, and it is in the process of establishing a new standard for customer service. In 2014 Chick-fil-A average sales per restaurants tripled KFC’s, making them the first in the food industry to make the largest amount of money the United States has ever seen. It is necessary to highlight that by 2015, the Chick-fil-A Company had around 1,950 restaurants and KFC 4,270. Chick-fil-A is now more profitable than every pizza chain in America and in 2014 its revenue reached $3.1million, against KFC $960,000 sales, according to QSR Magazine. Chick-fil-A has the 8th position in their ranking. Customer service is one of the most important aspects of the Chick-fil-A Company, a mystery since their employees are being paid roughly the same salary as in other food companies. The food restaurant says its success is based on their size, one location for each franchise, which allows them to train their employees better and to spread its strong-based company culture. A difficult task to complete in largest chains like KFC. Truett Cathy, Chick-fil-A’s founder, is fully committed to a personalized service, and now the company is securing its future by using a well-trained employee force and of course, technology. The commitment to personalized service led to Michel Lage and the Chicken-fil-A’s app. He had worked with Google and Facebook and was the person behind this project. Lage improved the Mobile Experience division of the company by creating and application that provides a remote option to plan a dining experience. The app offers the possibility to order a meal before getting to the restaurant and without making the line. It has the option to allow people to choose what they want from the menu and allows them to make any particular request, as an extra salad or no pickles. Chick-fil-A pays particular attention to what the customers have to say. The app encourages its users to leave comments and suggestions about their experience in the restaurant and with the app itself, to determine their needs and eventually improve the restaurants options and services. The app was downloaded more than a million times in only three days after its launch. The Rauxa marketing agency made a study that involved 80 brands of different industries and Chick-fil-A make it to the top regarding customer satisfaction. Ian Baer, Rauxa’s Chief Strategy Officer, said that even when the company only hires minimum wage workers, they can guarantee a personalized service. This is because Chick-fil-A employees are appreciated through a proper training that encourages better performances with the public. Other restaurant customer-service surveys say Chick-fil-A is popular for its quick and convenient service, its cleanliness and its hardworking team. The company understands what the customers wants and delivers it with precision. Chick-fil-A Company is known for being the home of the chicken sandwich and for its perfectionist menu, a key to their recent success. Paul Trotti, Chick-fil-A’s Director of Menu Strategy, confesses that it took them more than seven years to get the ideal grilled chicken and other four years to make their famous chicken sandwich. But that’s not it. What makes their options unique is their loyalty to its original idea. Their menu will not be affected by new options introduced in a desperate move to attract new customers. This means, no red meat on the menu and no meals different from lunch or dinner. A new trend that is improving the menu is the new salads, a healthy option that gets along with their tradition and their customer’s wishes. The company does not open on Sundays due to religious reasons (Sabbath) since 1946. 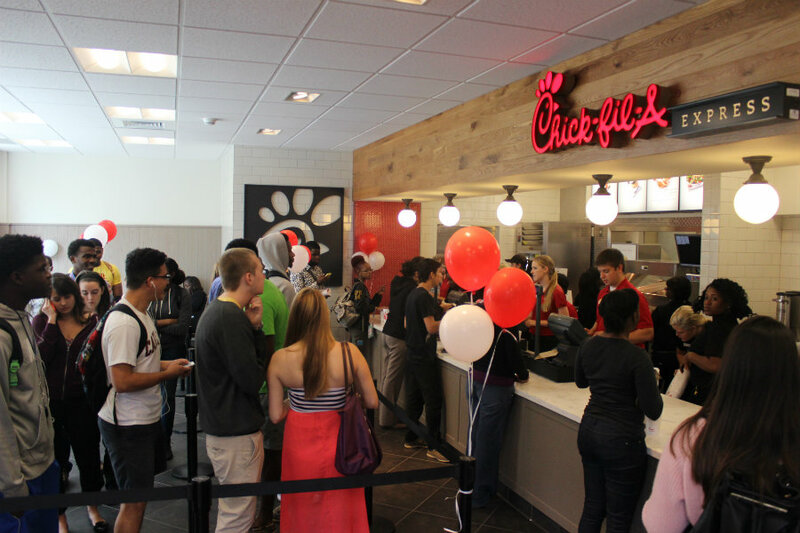 Chick-fil-A is based on conservative values that sometimes can be too conservative. In 2012 Dan Cathy, CEO of the food chain declared that he was against gay marriage, causing controversy across the country and social media. But today the company is oriented to a more inclusive message, and this was proven last Sunday. After the mass shooting at Pulse nightclub in Orlando, locals made a line to donate blood to more than 50 victims. In reaction to the generosity of the citizens, several businesses donated food to the donors, police officers, and paramedics that responded to the tragedy. Chick-fil-A was not the exception, and some members of the team opened the restaurant to cook and give free food to those who were helping the victims. A local news outlet said Chick-fil-A employees gave away ice tea and sandwiches to officers and people that were doing their part for the community.